Rob Phillips, senior writer for the Dallas Cowboys, reported that tight end Rico Gathers has been placed on injured reserve following a spell in the concussion protocol, and will be eligible to return to the full roster in eight weeks. Gathers, a standout in basketball at Baylor, was selected in the sixth round of the 2016 draft and spent the whole of his rookie season as a member of the Cowboys practice squad. 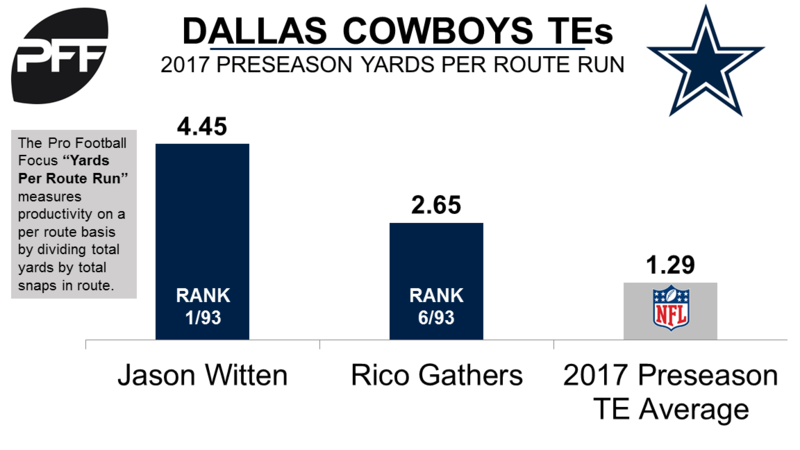 Prior to suffering the injury, Gathers had been putting together a strong preseason, and was one of the Cowboys top performers in their opening preseason game against the Arizona Cardinals, with a PFF overall grade of 82.0. In the two preseason games he played, Gathers saw considerable playing time, participating in 89 of 204 snaps, and his yards per route run of 2.65 ranked sixth among 93 eligible tight ends.